Our students are the foundation of the university. We are committed to providing the support you need to help you succeed! Below are a number of helpful links to get you started, and please do not hesitate to contact someone at the School of Music for more assistance. The University of Wisconsin-Madison is a highly ranked, world-class university that offers a cost-competitive tuition. Music majors at Madison benefit from individual attention within the School of Music, and have access to the opportunities of a premier research institution. Our atmosphere is collaborative, dynamic, and fun! We offer a reciprocal tuition relationship for Minnesota residents. To find out additional information about the Wisconsin-Minnesota Reciprocity Agreement, or to access current tuition information you can visit the Office of the Registrar web page. All prospective incoming undergraduates are considered for merit-based School of Music scholarships at the time of audition. Scholarships are offered to students who distinguish themselves as outstanding musicians through their musical backgrounds and by their audition performance, and who demonstrate outstanding potential for success in the music major at UW-Madison. Most scholarships are offered for a full four-year period and may range on a yearly basis from $500-$10,000. Read about how scholarships draw talent to the School of Music here. Learn about the Chancellors/Powers-Knapp Scholarship Program. Learn about Bucky’s Tuition Promise. Bucky’s Tuition Promise guarantees scholarships and grants to pay for tuition & segregated fees for students whose household adjusted gross income (AGI) is $56,000 or less. Incoming freshmen will receive eight (8) consecutive semesters (4 years) of free tuition & segregated fees and transfer students will receive four (4) semesters (2 years). Learn more about Music Clinic Tuition Remission Scholarships. All applicants who have auditioned in-person on a regular audition date, who have been admitted to the university by general admissions, and for whom we have a complete School of Music application file will be considered for a scholarship. No additional application is needed. Please see the School of Music Undergraduate Admissions page for our application and audition deadlines. Most final decisions on scholarships will be made after the last audition in spring. Students are notified electronically after decisions are made. Participate in an appropriate School of Music performing organization. Pianists must enroll for accompanying. Maintain satisfactory progress toward a music degree and complete a minimum of 12 credits per semester. All candidates for the graduate program are considered for funding awards. See the Graduate Admissions page for details. We highly recommend that students seek whatever scholarships or grants may be available through the UW-Madison Office of Student Financial Services. Please note that financial aid offers through UW Student Financial Services may be adjusted if a student receives a School of Music scholarship. Student support at UW-Madison reaches beyond finances. Our faculty and staff at the School of Music care deeply about their students. We understand that sometimes life gets tough, and students need someone to talk to. While we treat our students like family, we strongly encourage them to seek professional help through Counseling and Consultation Services. This on-campus resource is available for students, parents, faculty, and staff. C&CS offers face-to-face appointments, group counseling, as well as a 24-Hour Mental Health Crisis Services Hotline. No problem is too small, and mental health is vital for all of our students. The Mead Witter School of Music offers a variety of resources for students. Both prevention and treatment of music-related injuries is important. The Mead Witter School of Music has partnered with UW Health’s Performing Arts Medicine Program to provide a website full of information about muscular, respiratory, hearing, vocal, and mental health. The School of Music in conjunction with the College of Letters and Science promotes the highest level of professional development while challenging our students to achieve their greatest potential on their roadmap to success. We are committed to preparing our students to enter the workforce with the necessary tools and resources to become a professional in their field. The College of Letters and Science has established a new Career Initiative, to serve as a resource to students planning for their future. To learn more about the L&S Career Initiative, Advising, and Career Planning, click here! The School of Music maintains a blog for posting part-time job opportunities, as well as gigs in the area, and other professional development opportunities. We encourage students to take advantage of these postings to improve their resumes while earning a few extra dollars along the way. The University of Wisconsin-Madison campus, including the School of Music facilities, is ADA compliant. If you are having trouble finding information you need, or would like to suggest a change to information you have found, please contact the ADA Coordinator at 608-263-7400. Information about UW-Madison admissions and assistance to international students. 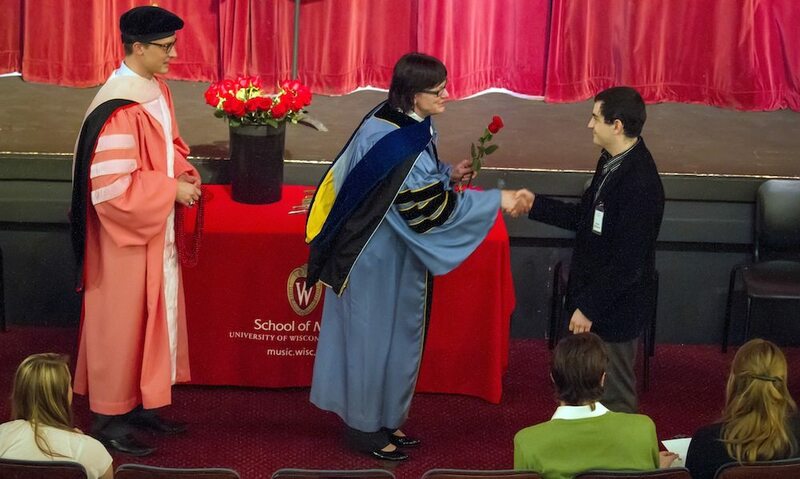 Director Susan Cook and Assistant Director Benjamin Schultz present graduation roses at the 2014 Graduation & Awards Recognition Ceremony in historic Music Hall.